Dog-friendly towns and villages near us. One of the big draws of Yorkshire for many visitors (aside from the stunning countryside) is that so many towns and villages across the North York Moors, Yorkshire Dales and Yorkshire Coast are so dog-friendly. You’ll find an array of dog-friendly pubs, cafes, restaurants, shops and of course holiday cottages. Here is just a small selection of some of Yorkshire’s dog-friendly towns and villages. Malton was recently named the UK’s most dog-friendly town and there’s lots of places here that you can happily take your four-legged friend to. 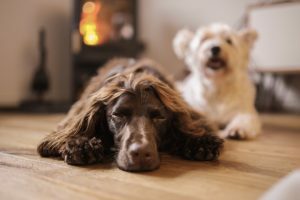 Dog-friendly places to eat include No.46 Café Bar, The Talbot and The Hidden Monkey and there’s plenty of walks to try (and country pubs to visit) in the surrounding Howardian Hills. Lovely Helmsley is the only market town in the North York Moors and doggies will be welcomed in many of Helmsley’s independent shops, tearooms and pubs. Helmsley Walled Garden and Helmsley Castle both welcome dogs on leads in their grounds. Dogs can accompany owners to The Vine House Café in Helmsley Walled Garden and this lovely eatery is fully licenced with bowls of water available for doggies. This entry was posted in Main News on January 29, 2019 by Jane Wheldon.